Film “Sign Painters” reveals some colorful characters. The format couldn’t be simpler. Thirty or so sign painters — from Seattle to Coralville, Iowa, San Francisco to Mazeppa, Minn. (in other words, all over) — talk about what they do and demonstrate how it’s done. These guys, and nearly all are male, are smart and funny and full of beans. They’re at once disarmingly practical and full of artistic élan. As one Texan says, “I basically do it all for me, and it will work out for the dude if I like it” — the “dude” being the client. Clearly, they love what they do. The wonder of “Sign Painters” is that it manages to show why. These painters are real characters, with their tattoos and ponytails and lax dress code. The late Keith Knecht (the movie is dedicated to his memory) is a case in point. If he wasn’t the savviest guy in Toledo, Ohio, you definitely want to meet the guy who is. Knecht recalls a skinnier, unsoured Billy Wilder. In his floral-pattern shirt, he looks like a cross between a racetrack tout and defrocked philosopher. “Sign Painters” is talky in the best — and rarest — sense of the word: the way that screwball comedy and Quentin Tarantino movies are. The words come fast and cut on the bias. When was the last time you’ve heard the term “viscosity breakdown” other than in a motor oil ad? 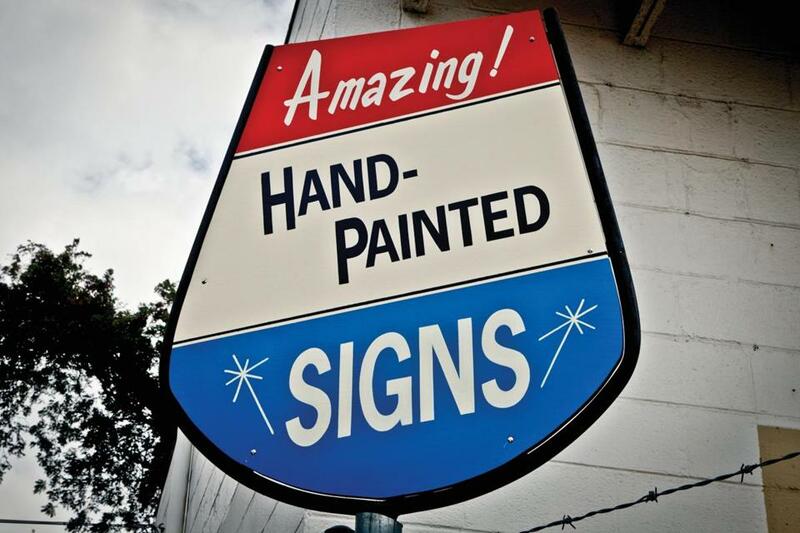 There’s an exhilarating kineticism to the speech in “Sign Painters.” Maybe it’s because signs are by their nature static, and their makers feel a need to compensate via verbal motion. The documentary balances the talk with displays of craft. We find out about gold leaf painting and stenciling. Typefaces and colors proliferate. There are truck brushes and dagger brushes and squirrel hair brushes and badger hair brushes. Sign painters are big on brushes. Sign painting isn’t exactly booming. It’s that standard cyber-age saga, digital overtaking analog. “I don’t know too many people my age doing it,” laments a 35-year-old from the Bay Area. The debut of sign-making software, in 1982, made professional sign painting seem like a luxury. Why hire someone to execute something by hand when some software and a cutting machine can give you uniform vinyl letters But people still appreciate fine craftsmanship. In some ways, they now appreciate it even more. So even if there aren’t as many sign painters as before, and they don’t make the living they did, they’re still out there, brush in hand and gleam in eye. “ ‘Victory Over Vinyl,’ ” says Vandervaart, “that’s a good name for a sign shop.” The look on his face as the thought occurs to him is priceless.